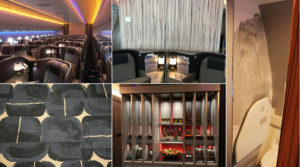 As the airline industry has always captured people’s imagination, airlines can tap into their country’s heritage to incorporate a bit of storytelling into the passenger experience. Legacy carriers in particular can benefit from their ‘flag carrier’ status to differentiate from cheap and cheerful low-cost airlines. Going local provides airlines – and their countries of origin – with a ‘soft power’ tool to showcase their national heritage and offer passengers a way to experience local culture onboard – even when they are only flying the airline to transit to a third country. This also resonates with consumer trends such as authenticity, storytelling and the rediscovery of national and regional identities in a rapidly globalized world. Airlines that are doing a good job in this perspective are Finnair, Icelandair, SWISS, Hawaiian, Etihad, Air New Zealand and China Airlines. 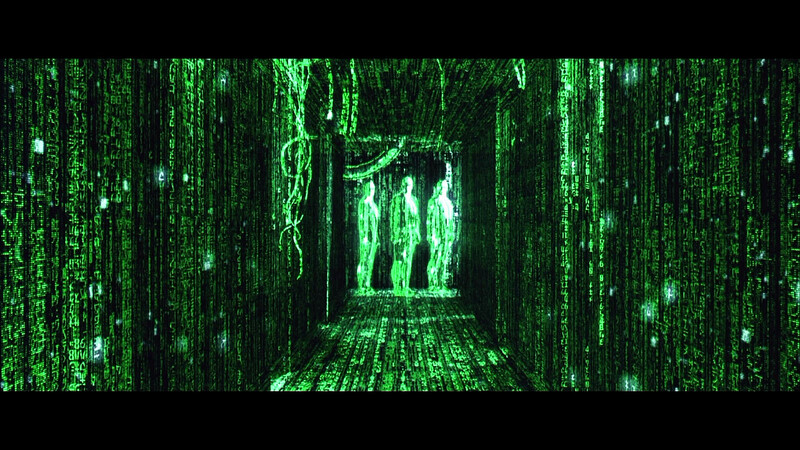 For more on this ‘branded experience’ topic, see this excellent article by Marisa Garcia. Apart from the wood veneer finishes, the cabin is also covered in a dark carpet with geometric images of the persimmon fruit. The negative spaces of the caligraphic drawings are of light gold colors while the positive spaces are dark blue. Furthermore, lavatories on the A350 also follow the local design philosophy in having a Chinese landscape ink painting on the wall. On the outside, China Airlines’ aircraft feature a large plum blossom – the national flower of Taiwan – on their tails. The plum blossom is one of the earliest blossoms of the year (as early as January) giving Taiwan its own cherry blossom season. 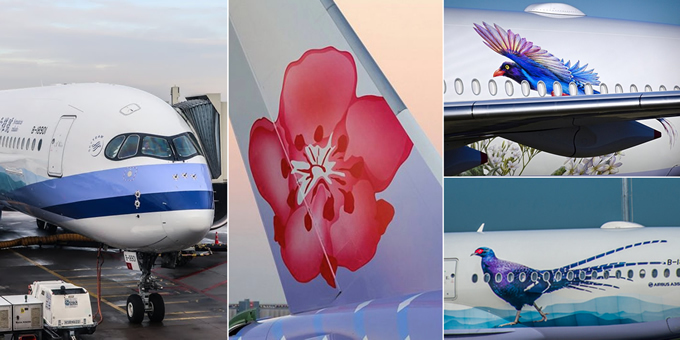 Along with plum blossoms in bloom, two China Airlines A350 aircraft also feature a large painting of two of Taiwan’s national birds on their liveries, as the island is renowned among bird-watchers. The ‘Syrmaticus Mikado’ (Mikado Peasant) is painted on the fuselage of the China Airlines’ first A350. The same Mikado pheasants and Yushan National Park, one of the areas it is known to inhabit, are also depicted on the Taiwanese 1000 dollar bill. To mark the 100th delivery of an A350 by Airbus, another China Airlines A350 features the ‘Urocissa Caerulea’ (Taiwan Blue Magpie), a species of bird of the crow family which is endemic to Taiwan. Following this delivery, China Airlines today has 14 A350-900 aircraft in its fleet, all of which have been delivered in the past two years.